Katsushika Hokusai, “The Great Wave off Kanagawa”. First publication: between 1826 and 1833. “Hokusai beyond the Great Wave” will be shown at the British Museum from 25 May through 13 August 2017. 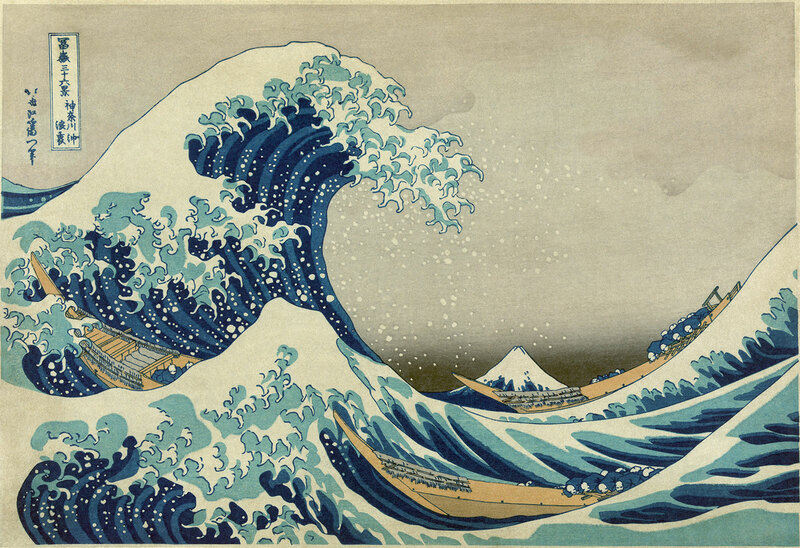 Katsushika Hokusai (1760–1849) is widely regarded as Japan’s most famous and influential artist. He produced works of astonishing quality right up until his death at the age of 90. This new exhibition will lead you on an artistic journey through the last 30 years of Hokusai’s life – a time when he produced some of his most famous masterpieces. Throughout the exhibition, outstanding examples of Hokusai’s work will show the artist’s creative breadth and depth. A selection of superb landscapes is introduced with the iconic Great Wave – itself part of a print series of views of Mt Fuji. Intimate domestic scenes capture fleeting moments in private lives. Exquisite depictions of flora and fauna display an innate skill in representing the natural world. The artist’s imagination is given full rein in the portrayal of supernatural creatures such as ghosts and deities. Through all of these works, explore Hokusai’s personal beliefs and gain a fascinating insight into the artist’s spiritual and artistic quest in his later years. The exhibition will include prints, paintings and illustrated books, many of which are on loan from Japan, Europe and the USA. This is a once-in-a-lifetime opportunity to see these extraordinary works together.